Longtime game developer Dave Ellis says that young designers should accept the fact that they may never work on a AAA title like Halo. "You don't always get to work on original games. In fact, you might never get to work on original games," Ellis, senior game designer at Vicious Cycle Software, told attendees at the East Coast Game Conference. But up and coming developers shouldn't let that discourage them, however, because just because you're not working on the next blockbuster smash, that doesn't mean you're not using your mojo. "It's fun and creative, just in a different way," he said. Many developers of licensed games fall back on ye olde 2d platformer, but Ellis says that with another valuable skill - the ability to find the story within the story - a clever designer can rise above the usual formula. In the movie Despicable Me, the main character Gru builds a rocket as part of his plan to steal the moon. 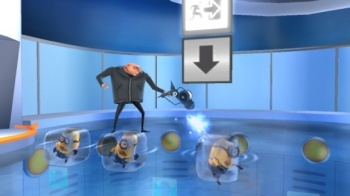 In the movie, the construction of the rocket is short montage, but Vicious Cycle decided to make that the entire point of Despicable Me - The Game. In the game, Gru must break into different facilities, complete flying levels, dodge traps, and solve puzzles in order to collect the bits and pieces he needs to build his rocket. Expanding on the source material in this way not only makes for a more engaging play experience, says Ellis, but it also "enhances the license by expanding the universe and gives the player something they haven't seen before." Licensed games typically have a much shorter development cycle than AAA titles, which is both good and bad. On the good side, a faster cycle means you can ship more games. On the bad side, you might find yourself having to create games practically overnight. Ellis and his team had just three months - total - to make the videogame tie-in for the Yogi Bear movie. "I didn't even know they were making a movie until we got asked to make the game," chuckles Ellis, who was a little amazed that they manged to make a game out of stealing pic-a-nic baskets and getting yelled at by a park ranger. Ellis wanted attendees to leave with this final thought: Working on licensed games may not be as glamorous as working on a game that has its own line of t-shirts, but it can still be a very rewarding living. A character Ellis created for a Ben 10 game even got made into an action figure. "That was so cool," he said. Very cool indeed, Dave. Now get to work on that Barney fighting game.